When the tournament has started everyone gets their tournament game lobby. To enter the lobby, press the go-to-game button on the tournament page or under your "Activities" in the right sidebar. Note: If the tournament isn't full (16/32/64 teams), you may receive a BYE match, meaning that you won't play your first game until round 2. The map vetoing will begin once all team members in both teams have entered the lobby and become "ready". In most tournaments, you will have around 2-10 minutes to enter the game lobby, depending on tournament settings. This is called the "Go-to-lobby timer" and is indicated on the Tournament overview under "Game settings & format". A team or player who doesn't enter the lobby in time may be disqualified automatically. Both teams take turns banning the maps and server locations they don't want to play on. The map to play on is then chosen randomly, or by exclusion (if no more maps are left) depending on the pick and ban style that is used. Each team or player has 2-5 minutes to make the first map ban, and then 30 seconds for every other ban or pick (including the match server location). The exact length of the Veto process will vary depending on the Go-to-Game timer settings of the tournament. For a bo3 or bo5 match, all maps for every game is picked/banned in the first tournament game lobby of the match. When a map and server has been selected, the server is started and all players can enter the server. Please mind the go-to-game timer! If your team is not "ready" in-game within that time you will automatically loose the game and might get disqualified. Usually, you will have about 7 minutes in Aim map games (1v1 & 2v2) and 8-10 minutes in Competitive games (3v3 & 5v5) to join the server and start playing. Press the "launch" button or copy and paste the server IP to connect through the in-game console. Some players experience lag or FPS drops when entering the server via the Launch button. If this happens, use the IP address instead. 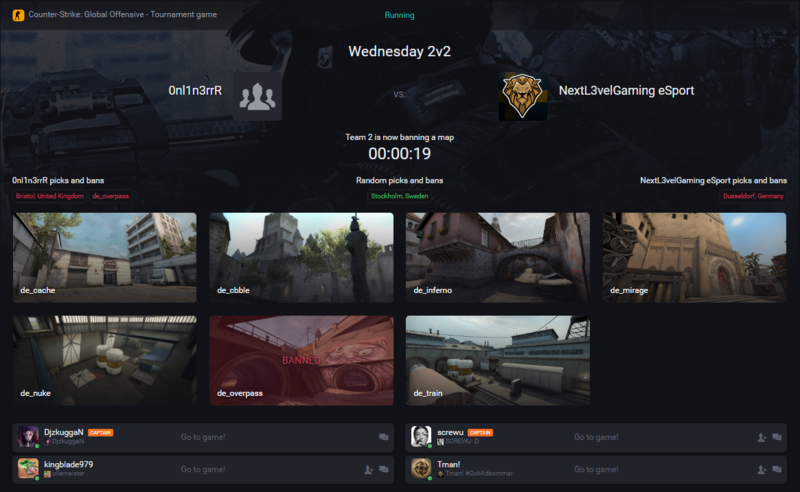 Once you are in the CS:GO server, the system will set you as "ready" automatically within 30 seconds of joining. Alternatively, you can type !ready or /ready to signal that you are ready to play. When all members from both teams have done that, the match starts. Since we host our own game servers, all the match results are automatically reported to Challengermode. When the game is over, and if you have more games to play in the tournament, you will be able to proceed to the next round by clicking the continue button in the game lobby.